Hey, look whose actually posting news for a change? But enough with me ragging on myself, we’ve got more important matters to attend to. We have confirmation for Season 20, newly released DVD sets, (one of which will blow your mind), and some new official pics for Super Robot Chogokin Daizyujin (okay, that’s really Sentai news, but it’s still cool anyway). IT’S MORPHIN’ TIME! The article also talks about how Saban Brands was able to revive the Power Rangers Brand, the Brand’s new Worldwide Reach, the growth of the Paul Frank Brand (also owned by Saban), and just Saban Brand’s amazing new-found success. Known to Power Rangers fans fondly as the Megazord from MMPR, this figure stands at 140mm tall, comes with signature sword and shield, and a couple of effects parts. Note that it cannot transform into the “tank mode”, as the main priority with the Super Robot Chogokin toy line is articulation (and a very thorough level of detail). It costs 5040 yen and is expected to come out in September. While normally I avoid covering stuff like this (due to my own inability to afford stuff like this), it was worth mentioning. I mean just look at it…. not even out yet and it’s probably one of the best figure versions of Daizyujin I’ve seen yet. UPDATE: This figure will be available from retailers in the US and Canada on October, for the price of $60.99, just in time for the start of the Power Rangers 20th Anniversary celebrations. This according to Tamashii Nations USA Facebook page. Super Sentai Battle Ranger Cross Opening: Five Teams, 25 Rangers, One AWESOME Game! The game is out now! Author M.F. CalhounPosted on September 15, 2011 Categories MC's postsTags Bandai, clip, intro, Namco Bandai, Super Sentai Battle: Ranger Cross, videoLeave a comment on Super Sentai Battle Ranger Cross Opening: Five Teams, 25 Rangers, One AWESOME Game! Kamen Rider Fourze Astro Switch sets: Up close and personal. Alright, it looks like music day is over. Oh well. At least we can get a better looks at the Astro Swicth sets. Here’s set 1 with Astro Switches 7 and 8, and it comes with the Fourze Base State Ganbaride card. This is speculation, but I’m pretty sure that 7 is a parachute, and 8 is a circular saw. They actually look very complicated up close. Here’s set 2, with Astro Switches 12 and 13. Not sure what they do, I’m sure we’ll find out soon. And of course, it comes with a musterious Ganbaride card. Here’s set 3, with Astro Switches 18 and 19, and a Ganbaride card. These are jumping into the higher numbers very quickly. And finally we have set 4, with with Astro Switches 21 and 22 and a Ganbaride card. Each set will be priced at 750 yen, and is expected to be released monthly, with set 1 coming out in September, set 2 in October, set 3 in November, and set 4 in December. Each set will come with a special Ganbaride card for Fourze, presumably those for his different States. P.S. : Yesterday was the anniversary of Neil Armstrong becoming the first man on the moon. Considering the theme for this Rider, that just seemed very relevant. Of course, it’s extremely relevant by itself, but still. Author M.F. CalhounPosted on July 21, 2011 July 21, 2011 Categories MC's postsTags Astro Switches, Bandai, info, Kamen Rider Fourze, sets, Toys!Leave a comment on Kamen Rider Fourze Astro Switch sets: Up close and personal. SRC Patstriker? : First announced attachment for SRC Go-KaiOh! A new magazine scan has just popped up featuring the newly announced Super Robot Chogokin Dekaranger Robo, but that’s not the only thing shown here. It also displays what seems to be SRC Go-KaiOh’s first attachment: the Super Robot Chogokin Patstriker! Able to come apart and attach itself to the SRC Go-KaiOh forming DekaGo-KaiOh, the price and date of this new figure has not been announced yet, however, we can assume that it will come out around the same time the SRC Dekaranger Robo comes out in October. For any Super Robot Chogokin fans, be sure to be on the lookout for this! Author M.F. CalhounPosted on July 17, 2011 Categories MC's postsTags Bandai, Patstriker, Super Robot Chogokin, Super Robot Chogokin Dekaranger Robo, Super Robot Chogokin Go-KaiOhLeave a comment on SRC Patstriker? : First announced attachment for SRC Go-KaiOh! New S.H. FiguArts figures for 2011-2012: Or, how Bandai is truly, truly evil. So look at what the experts in the art of wallet draining have come out with now, a new batch of S.H. FiguArts figures! 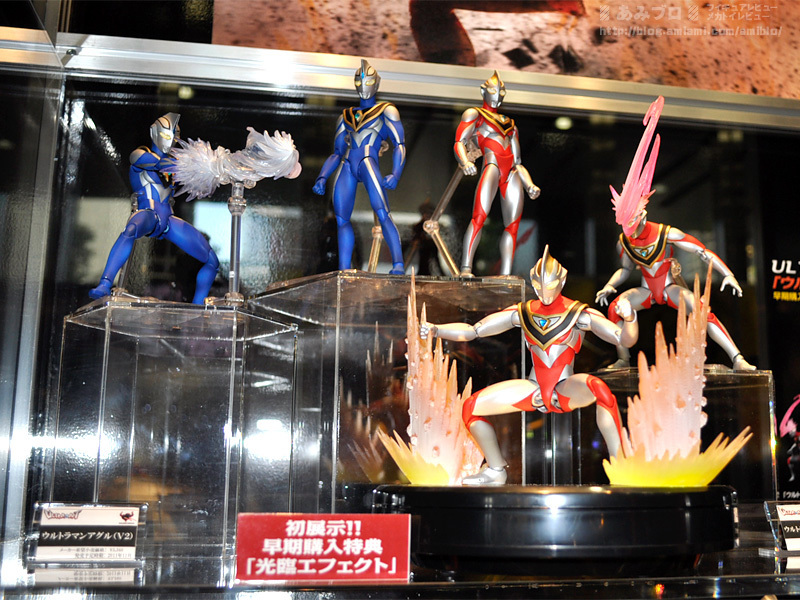 These new pics come from the Tamashii Festival 2011, showcasing Bandai’s and Tamashii Nation’s new line of S.H. FiguArts figures. First up was the complete S.H. FiguArts Kaizoku Sentai Go-Kaiger! That’s right, all five Go-Kaigers. Go-KaiRed will be released this September, with Go-KaiBlue and Go-KaiGreen coming out in October, though no word on the release date for Go-KaiYellow or Go-KaiPink. Each figure will come with different parts to build the full brifge to the Go-KaiGalleon, and each will cost 3500 yen. To be released in September and October respectively, are SH FiguArts Wild Tiger and Barnaby Brooks Jr. for 4500 yen each. Future releases include SH FiguArts Rock Bison, Sky High, Fire Emblem, Lightning Kid, Blue Rose and Origami Cyclone; FiguArts Zero Kotetsu Kaburagi and Barnaby Brooks Jr.; and SH FiguArts version of their motorbikes. I haven’t just nerdgasmed, I’ve toku-gasmed! Wait, is that Mezool and Gamel in the back? I’ll admit, this one is a bit of a surprise to me, not that they did it, but that they skipped over everyone else (except for GoseiRed). Definitely not surprised by this one! Yes, it’s the Super Robot Chogokin Dekaranger Robo! The articulated, diecast model of the main mecha for Tokusou Sentai Dekaranger. It comes with (as far as we know) the Signal Cannon and Judgement Sword. Price and release date to be announced. That’s it so far from the Tamashii Festival, I’m sure there’s still plenty more bank-account-draining stuff to come, so stay keep checking back. Here we have Ultra Act Ultraman Gaia V2 and Ultraman Agul. Both come with special effects parts from their signiture attacks. Ultraman Gaia V2 will be released in October for 3360 yen, while the Ultraman Agul figure has no announced price or release date. And from Ultimate Force Zero, we have Ultra Act JeanBot and Mirror Knight (the same figure I covered yesterday, but in a different pose). 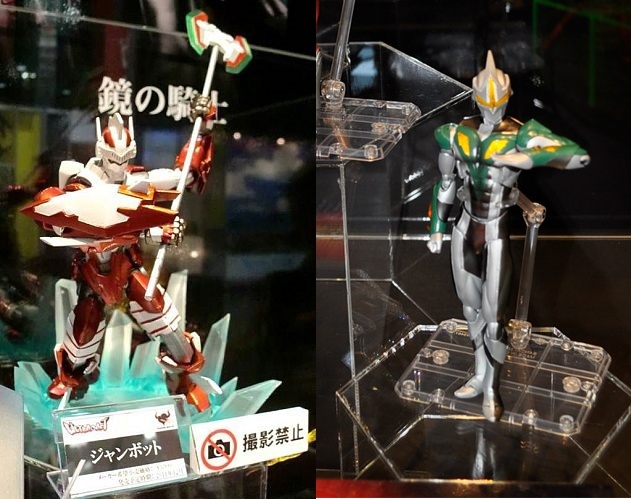 Price and release date for both have not been set, however the Ultra Act Glen Fire figure (not pictured) is set for release this September for 3360 yen. Author M.F. CalhounPosted on July 15, 2011 July 16, 2011 Categories MC's postsTags Bandai, Dekaranger, Dragon Ball Z, GoseiKnight, Kaizoku Sentai Go-kaiger, Kamen Rider DEN-O, Kamen Rider Eternal, Kamen Rider OOO, Kamen Rider Ouja, Kamen Rider Ryuki, Kamen Rider V3, Kamen Rider Zolda, Mirror Knight, S.H. FiguArts, Samurai Sentai Shinkenger, Super Robot Chogokin, Super Robot Chogokin Dekaranger Robo, Tamashii Festival 2011, Tamashii Nation, Tiger & Bunny, Ultimate Force Zero, Ultra Act, Ultraman Agul, Ultraman Gaia, Ultraman Zero, Vegeta6 Comments on New S.H. FiguArts figures for 2011-2012: Or, how Bandai is truly, truly evil. Life size Char’s Zaku to be Erected in Japan: Will this one work? Way back in the olden days of 2009, a life-size statue of the RX78-2 Gundam was built and erected in Tokyo for a short period of time (a couple of months or so), and now some young staff members from Mibu, Japan’s Toy Town, have formed a volunteer team to erect a life-size statue of Char Azanable’s Custom MS-06S Zaku II. The Zaku II statue will stand at 18 meters (59 feet) tall, and costs for design and construction have been estimated at several billion yen. “There are Gundam fans all over the world. We want to call (for cooperation to build the statue) throughout the world with Twitter and Facebook,” noted Takayama Hiroshi, one of the 30 or so volunteers in the group. In another attempt to gather funds, they will also be selling 1000 limited-edition cups of strawberry-flavored juice cocktail, with an image of Char’s Zaku on the cup, at 100 yen during a charity event for the Great Eastern Japan Earthquake Disaster on July 16th. Well, this definitely sounds interesting, last time I heard news about something like this, it was the Gigantor statue project, which so far has been successful (and was made into a permanent fixture, unlike the Gundam statue). It’s an actual giant robot in Japan. What’s not to love? Who cares if it’s the bad guy’s personal Gundam, that doesn’t change the overall awesomeness of the whole thing. The only complaint I have is the same you I know you guys will have: Why isn’t anyone trying to do this with Super Sentai? They have 33 years worth of giant robots to choose from. Seriously, someone get on that. Author M.F. CalhounPosted on July 12, 2011 July 12, 2011 Categories MC's postsTags Bandai, Char's Zaku, giant robot, Gundam, real-life, statue, TokyoLeave a comment on Life size Char’s Zaku to be Erected in Japan: Will this one work? Kamen Rider OOO Premium Medal Set: I hate you, Bandai. I hate you. Who am I kidding, I love you so much! This is the P-Bandai Online: Kamen Rider OOO Premium O-Medal Collection. For anyone who has kept up with collecting the Medals as they were being released, just start kicking yourselves now. It is a complete set of core medals, BuraKaWani Medals included, and a complete set of Cell Medals. The collection, due out July 25th, is currently available for preorder for the hefty price of 18900 yen (about $236). The release is similar to the Gaia Memory set released for Kamen Rider W for a similarly high price. Well, if you’re really interested in collecting all of the Core Medals, and you’ve got the money to get it, then this is the collection for you. Author M.F. CalhounPosted on June 17, 2011 Categories MC's postsTags Bandai, Kamen Rider OOO, Premium O-Medal Collection, ToeiLeave a comment on Kamen Rider OOO Premium Medal Set: I hate you, Bandai. I hate you. Who am I kidding, I love you so much! Create your own Kamen Rider OOO: Random Combo Soft Vinyl figures specially made for you! Starting Saturday (wait, that’s tommorow!) Bandai will let people create their own combo for OOO by mixing and matching parts to create one of 119 possible Combos, which they will make into a custom SoftVinyl figure and ship directly to you! The OOO SoftVinyl Factory is the first project in the “OrderMade Bandai” effort. On a special Bandai website, customers can pick and choose from head, torso, and leg parts to make their own custom OOO figure. 119 theoretical random combinations are possible. And Bandai will manufacture the figure and ship it direct to the customer within two weeks, all for 1050 yen (about $13). But that’s not all. For the ultimate collector, Bandai will also be offering all 119 figures in one massive set, including an autograph “signed” by show character Kougami Kosei, all for 124950 yen (about $1548). They will only sell 100 of these sets, so if you have the money to spend on it, go right ahead. Though it would be way cheaper to just get a couple of custom figures. If this prooves to be successful for Bandai, then I would expect similar ventures in the future. Author M.F. CalhounPosted on June 17, 2011 June 17, 2011 Categories MC's postsTags Bandai, Combos, custom figures, Kamen Rider OOO, OrderMade BandaiLeave a comment on Create your own Kamen Rider OOO: Random Combo Soft Vinyl figures specially made for you! Power Rangers Samurai Wii Game Reveals: Nothing says “Power Rangers” Videogame like unoriginal coverart. Currently the price is set at $39.99 and is set for release on 9/1/11 (Sept. 1st). The release date is a bit unexpected, as it was anticipated to be released by the holiday season, but an earlier release wouldn’t be detrimental to sales. I’ll admit that I don’t have a Wii, so I won’t be able to play it. But if you do, then go and preorder it from Gamestop right now! Author M.F. CalhounPosted on June 17, 2011 Categories MC's postsTags Bandai, Gamestop, Nintendo Wii, Power Rangers SamuraiLeave a comment on Power Rangers Samurai Wii Game Reveals: Nothing says “Power Rangers” Videogame like unoriginal coverart.